Fantastical MMORPG worlds are filled with wondrous places to visit , but when it comes down to endgame raiding, a lot of time is spent staring at some giant’s ankles. While there’s little else that can match the relief and elation of finally downing a towering raid boss a hundred times your size, the thrill of the hunt can dull if it’s just yet another gargantuan beast you’re cutting down to size. 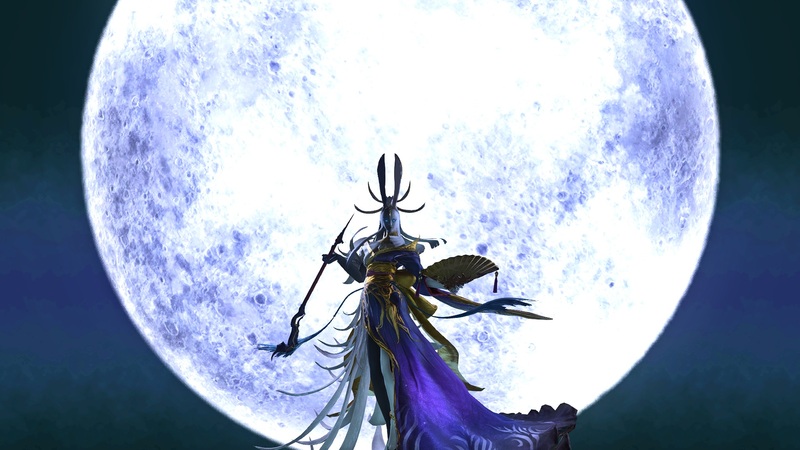 The Final Fantasy XIV team has shown it has grander ambitions for its boss designs. Not only are the encounters audiovisual treats full of delirious special effects, they also have clever and challenging mechanics weaved in that elevate them beyond simple ‘tank-and-spank’ slogs. They aren’t just a gauntlet of lengthy health bars to chip away at until the target topples over – they’re complex multi-part ordeals. Of all the raid bosses in the game there’s one that stands head and shoulders above the rest. It’s the fight that concludes a significant chapter of the Stormblood expansion storyline – one lauded by players for how it combines story, mechanics, and music to make for an incredible whole. To understand why the encounter with Tsukuyomi has had such a resonating effect it’s important to lay out the context. Naturally, there are spoilers for Stormblood and it’s updates below. 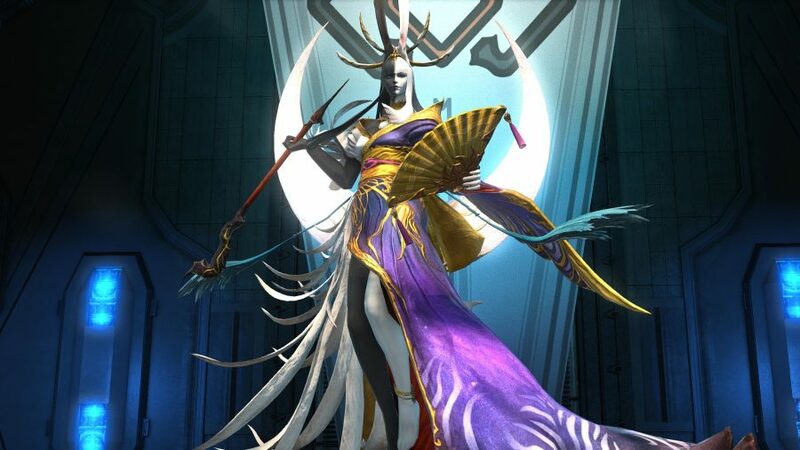 Yotsuyu is one of the main antagonists in the Stormblood storyline. For the majority of the game, she’s the tyrannical ruler of the region called Doma, which players venture to in order to free it from the Garlean Empire. Yotsuyu’s hatred of the kingdom is fuelled by how poorly it treated her in her younger years. She lures players to Doma Castle so she can collapse it and kill everyone inside. However, everyone escapes except for Yotsuyu and a player ally called Gosetsu. The climactic battle between Yotsuyu and players sees the former ruler succumbing to her inner turmoil and morphing into a magical being – or Primal – named Tsukuyomi. Final Fantasy XIV players have encountered many similar beasts in the past but this one is visibly charged with the theme of the scenario. “We started with her two sides. The new moon, the dark side – and the full moon, the bright side. Having that as the focus for the battle, and then bringing out her inner conflict within the battle,” Yoshida explains. That duality is clearly represented in her design, with the skin on the left side of her body appearing pale, while the skin on the right is much darker. As for the fight itself, it has three different phases, forcing players to employ different strategies as they adapt to different mechanics on the way to victory. The first is a fairly comfortable introduction – a few moves to dodge and group-wide blasts of damage to heal through – but the second phase is perhaps the most overt in bringing out that internal conflict within Yotsuyu. It starts when she collapses in the middle of the arena and is assailed by an array of ghostly figures from her past. These spectres include figments of the villagers she’s wronged in the past, as well as the parents who mistreated and abandoned her as a child. Players must work together to draw together these enemies and defeat them within a specified time limit before Yotsuyu’s suffering reaches a critical level and wipes out the entire party. During our chat, Yoshida jokes about a friendly rivalry between newcomers and veterans of the battle planning team. Each tries to improve upon what the other has created before when designing encounters, which has led to some bold and adventurous raid boss designs. Hopefully that competition sparks many more battles like this in the future. Sure, it may have a touch of the ridiculous to it, and is essentially a time-restricted burn phase that countless raid bosses have featured in the past, but the reasoning surrounding it is what makes it effective. 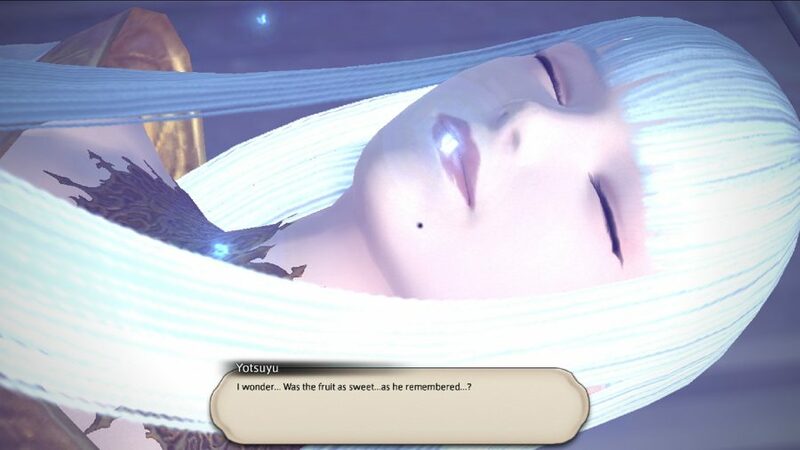 That feeling is multiplied in the final part of the phase when the spectre of the Garlean ruler Zenos appears with one final attempt to crush her spirit. Swooping in at the same time, however, is the spirit of Gosetsu – a force of good that has shown Yotsuyu the compassion and kindness that she lacks in her life. The two dramatically clash over Yotsuyu and so players must rush in to assist by defeating the final spectre of Zenos to free her. One of the reasons the fight may have resonated so well is because players feel directly involved with the outcome of the story. 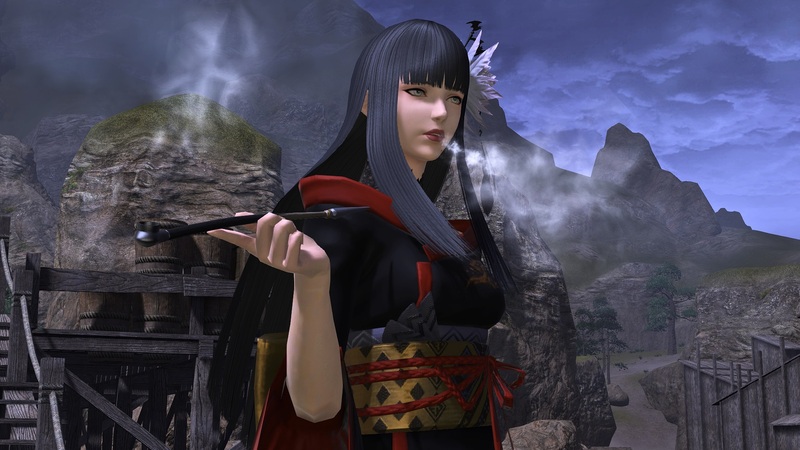 Final Fantasy XIV’s consistently strong writing has made Yotsuyu’s plight engaging in cutscenes, but in the encounter with Tsukuyomi you watch it develop right in front of you. Then the Final Fantasy XIV team skilfully repurpose classic MMO boss mechanics to emphasise the players’ parts in the story further. For once, it’s them fighting for her psyche, them trying to eliminate the negative thoughts. 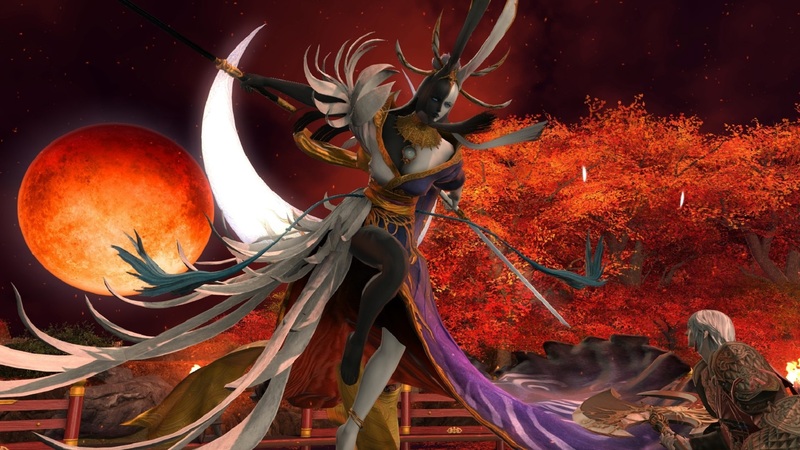 Helping to heighten the drama of the encounter is the work of Final Fantasy XIV’s composer, Masayoshi Soken, and his gorgeous and absorbing score Tsukuyomi’s Theme. On a number of times, when attempting to clear the harder ‘Extreme’ version of this trial, my party members have been heard humming the twinkle of piano keys as the fight transitions into the third and final phase. Those two adjectives could absolutely sum up the final phase of the fight. The arena shifts from a mechanised exterior and into a beautiful autumnal field, leaves falling from the sky while a blood moon shines brightly. Mechanically, the fight develops further too, as players must balance a light and dark debuff on themselves to counter the expanding light or dark sections that spread across the arena floor. And so players not only have an interesting battle mechanic to get to grips with, they’re struggling to stabilise two opposing forces – just as Yotsuyu has been.